Over the past couple of years, my life has changed in so many ways… I’m grateful for everyday that I’m able to get up and do what I love. It’s a blessing that I’ve had the opportunities and talents to be a creative for a living. The world of design, much like my own life, is constantly evolving and changing with the times. 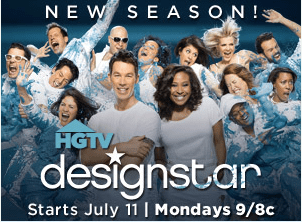 In this debut post for my new Blogging Platform, I’d like to go back and talk to a few of my peers about how their lives may have, or may not have changed since appearing on a little show we were all on, called Design Star! I gave everyone the opportunity to opt out of answering the questions, as I understand that the show may have not been the most ideal situation or portrayal for all. So no judgements! To kick off the Q&A with my Season 6 buddies is the always animated Kevin Grace! He was such a hoot in the loft, uplifting all of our spirits with his own brand of funny! He provided much needed comic relief at the end of those ridiculously long days on set! My experience on Design Star was more than I could have imagined…… Both Good and Bad. I knew that I would be judged and critiqued on a hourly bases both by the Judges and by the other designers. Notice I didn’t say “Fellow Designers” because I knew I would not be seen as a threat based on my lack of experience. Episode 2 came real quick for them. Just saying. However, with that said, I also never expected to make such great friends on this journey, and I am so grateful to say that some of them still remain dear to my heart. No one could ever really say they know what their getting into on a Reality show until your there. One of the things that was most important to me when agreeing to join the cast, was that I remain true to who I am, and then they wouldn’t have anything crazy to edit around me. I am so happy to say that “Yes” I am that same crazy energetic guy you see on the show. No apologies at all. Since the show, my life has change in so many great ways!!! Trends are so fickle, you really can’t rely on them to hang on for to long, so I always try to explain to my clients, that if your going for the latest “Thing”, lets try to make it as removable as possible in case it dies fast. ie: paint/pillows/rug-all easily removable if the trend moves on, then you can too. Hope everyone enjoys Season 8 this summer. We all know it will never get as good as it was in season 6!!! Way to go Kev! We love you and hope to see lots more of you! Check back soon to see what else is going on with my Design Star family!